If you are moving or visiting Mesa, Arizona, this is the packet for you. Instantly get a directory of schools, services, entertainment and other businesses that you need to successfully relocate. Are you thinking of moving to Mesa, Arizona? Is your business relocating you or you relocating your business? This is the packet for you. Instantly get a directory of schools, services, entertainment and other businesses that you need to successfully relocate. Best of all, all of the businesses and organizations contributing to this packet are members of the Mesa Chamber of Commerce, so you know they are ethical, solid businesses that are ready to earn your trust. This cost is to cover shipping only. 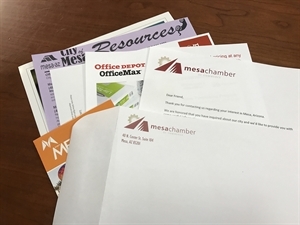 Persons local to Mesa, AZ are welcome to stop by the Chamber office and receive a packet at no charge.